Beginning at the outlet of Bow Lake in Strafford, New Hampshire, the Isinglass River flows freely for 18 miles through the communities of Strafford, Barrington, and Rochester until it joins the Cocheco River. The Isinglass River watershed is approximately 75 square miles in area and includes the Mohawk River, Nippo Brook, Berry's River, Green Hill Brook, and the outlets of Hanson and Ayers Ponds. Despite being situated in one of the fastest growing regions of the state, the Isinglass River is appreciated for its outstanding natural beauty and water quality, as well as its historical, educational, recreational, wildlife and plant characteristics. Most of the Isinglass River remains in a predominantly natural state with its banks lined by natural vegetation. There are few docks and no manmade impoundments or diversions (not including withdrawals) along its entire length. 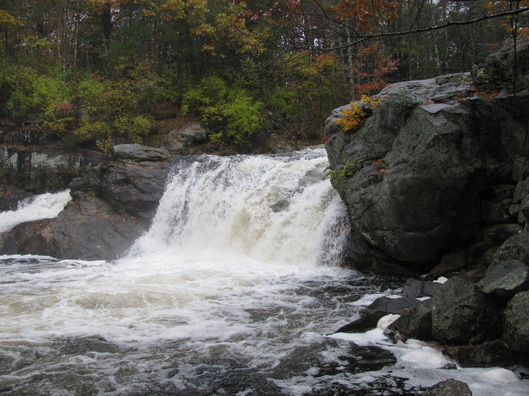 Numerous areas of rapids occur along the river, including Locke's Falls, which is a site of singular beauty. Land use along the Isinglass River is primarily rural. Given the river's proximity to the rapidly developing seacoast region, it is important to recognize that the river corridor remains largely undeveloped, with only periodic bridge crossings and occasional riverside residential development. Also noteworthy, is the free flowing nature of the river, as it is uninterrupted by man-made dams for its entire length, although beaver dams are common throughout the watershed and may create temporary obstructions to river flow. From its headwaters, the ecosystems within Isinglass River corridor are best characterized as dry coastal forest with pockets of wet and moist coastal forests intermixed near the wetland complexes. Presumably, the river exists today largely as it did over three hundred years ago prior to European colonization. The U.S. Geological Survey (USGS) and NH Department of Environmental Services have recently reactivated a gage station on the lower Isinglass River near its confluence with the Cocheco River. Real time and recent historical river flow and temperature data are available at the webpage for USGS gaging station # 01072870. Median flows have historically ranged from a high in springtime of over 200 cubic feet per second (cfs) to a low of 12 cfs in September. The Isinglass River corridor is predominantly undeveloped and therefore considered significant for its natural resources, as identified in the Land Conservation Plan for New Hampshire's Coastal Watersheds. Beginning at Bow Lake Dam, the river flows through a short section of low impact development in Bow Lake Village before crossing under route 202A. From this point to the Route 126 crossing in the Town of Barrington (approximately 6 miles) the river flows through a large tract of undeveloped land consisting of forested uplands and wetlands. Only one distant residential development is contained within the river corridor in this section of river. An over 300-acre conservation area known as the Isinglass River Conservation Reserve permanently protects over 7,800 feet along the Isinglass River in Strafford. The project was ranked first in the nation under the federal Coastal and Estuarine Land Conservation Program and federal funding for the land purchase along with additional landowner donations and easements helped create the Reserve which includes a total of 868 acres. The protection effort was supported by the technical expertise and funding capability of Bear-Paw Regional Greenways and the Trust for Public Land. The Stewardship Plan for the reserve was developed in 2010 to understand and appreciate the values of the Isinglass River Conservation Reserve and to guide the use and management of these resources over time. Between the Route 126 and Route 202 bridges, the river is visible from the road and provides excellent access for anglers and paddlers. There is minimal residential development in this section of the river corridor. Downstream of the Route 202 bridge, Scruton Pond Road parallels the river which is not visible from the road. With significant funding and technical support from the NH Land and Community Heritage Investment Program, the NHDES Wetland Mitigation Program, the Trust for Public Lands and the US Department of Agriculture Natural Resource Conservation Service, the Town of Barrington select board approved additional funding in late 2014 to protect 300 acres of forest including two miles of Isinglass River shoreline. 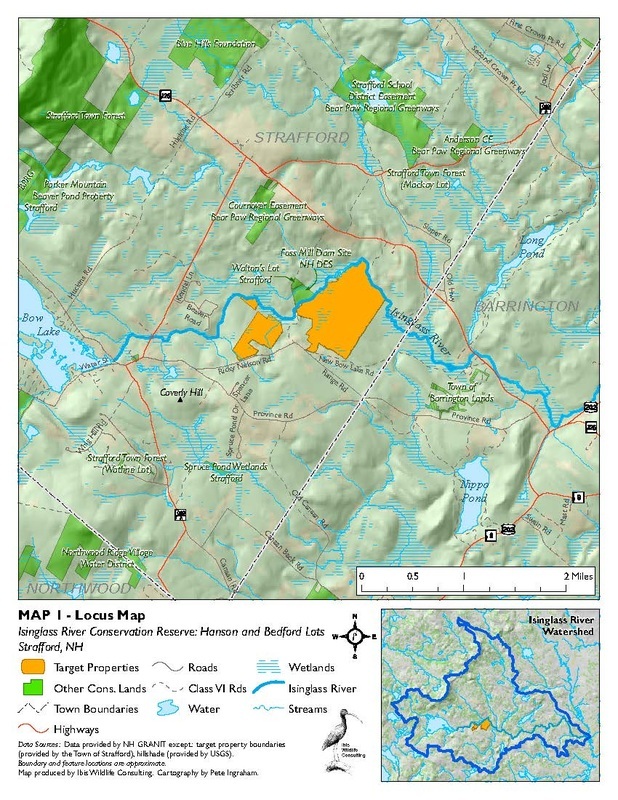 The A. Harlan Calef Isinglass Preserve is composed of forested wetlands, vernal pools, riparian habitat, and forested uplands, and will be managed by the Town of Barrington as a community forest. From here downstream to the Green Hill Road bridge, high banks covered with a mix of deciduous and coniferous forests and a few seasonally wet floodplain areas buffer the river. Through this section much of the land abutting the river is privately owned and remains undeveloped. A majority of the development within the Isinglass corridor occurs from the Green Hill Road bridge downstream to the river's confluence with the Cocheco River. Development is limited to small cluster housing developments, small commercial development, and bridge crossings. In fact, one of the largest pieces of land dedicated to open space in the Isinglass corridor lies within the City of Rochester and is owned by Waste Management, Inc. Known as the Turnkey Recycling and Environmental Enterprises (TREE) facility, Waste Management, Inc. has dedicated over 100 acres of riverfront property to open space and recreation as part of the ﻿﻿Gonic Trails at the Mount ﻿﻿Isinglas﻿﻿ Recreational Area﻿﻿. Although no permanent development restrictions are placed on it, this parcel of land has a network of forested streamside trails, a picnic area, and a canoe launch. Waste Management also actively manages 150 acres of land for wildlife under the Wildlife Habitat Council program. Similar to most of New Hampshire, the bedrock underlying the Isinglass River corridor was covered by unconsolidated deposits of till following the last glaciation. 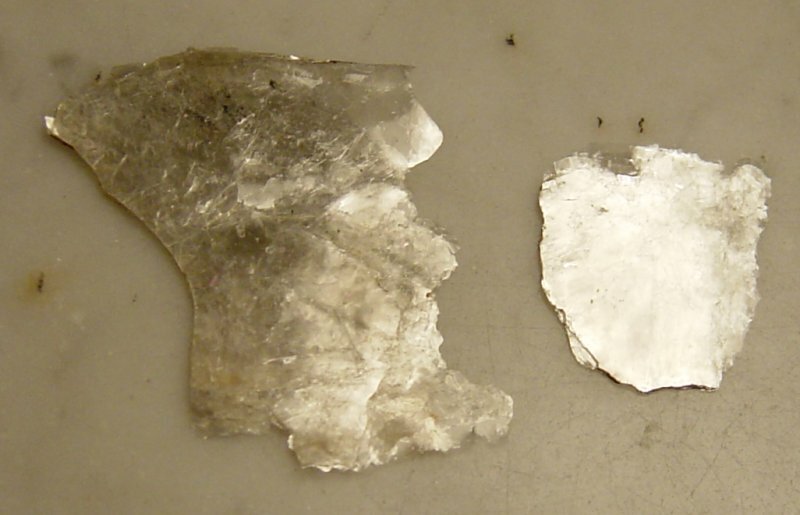 A valuable mineral known as mica was mined from the Town of Strafford during the early 1900's. This mineral, also referred to as "isinglass", was used to make windows, lampshades, clock faces, and other goods and accounts for the river's name. In areas where the underlying bedrock protrudes, unique rock formations are visible and account for the scenic cascades and waterfalls over which the river flows. A study of the river corridor's surface geology concluded that the contemporary Isinglass riverbed is a remnant of a much larger river channel, known as the Mallego Channel, that was anywhere from 40 to 70 feet deep. While the groundwater resources in the area include several aquifers within the Isinglass corridor, none of these are reported to be significant. 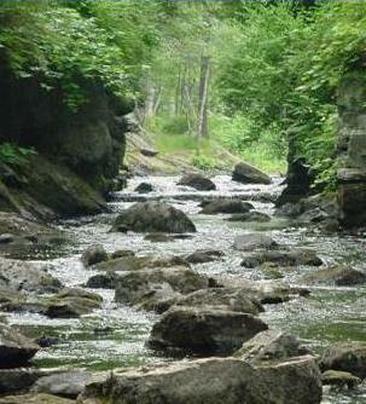 In 2009, the NH Geological Survey conducted a comprehensive study of the fluvial geomorphology of the river. The purpose of this study was to identify sections of the river vulnerable to erosion and change of course under heavy rain events like we had in the 2006 and 2007 floods. More information on this important program can be found at the NHGS Fluvial Erosion and Geologic Hazards Program page. Similar to many other waterways in New Hampshire, there is ample evidence of pre-European settlement in the Isinglass River corridor. Both artifacts and written histories of riverside trails suggest that native inhabitants of this region utilized the Isinglass River as a food and water source, as well as a travel way. The Squanamagonic Community is an example of pre-European development in the Gonic section of Rochester. Squanamagonic means "the water of the clay place hill" by the native Abenaki of the Pennacook tribe who inhabited the area. The Isinglass also offers archeological sites that define the evolution of local economies from the 18th century through to the mid-20th century. Colonization of this region by European settlers led to more intense use of the resources contained within the river corridor, including wood harvesting for ship masts, and the subsequent utilization of the river to transport the materials downstream to a more accessible seaport. At least nine historic mill sites are known to exist on the Isinglass River, with more located on tributaries, as evidenced by their remaining foundations. These were used to produce a variety of goods ranging from flour to lumber. The remnants of these mill sites are still visible at many locations along the river, with perhaps the most impressive being the Locke Mill site in the City of Rochester. The mills bear witness to production activities ranging from lumbering to agricultural products to fabric. Locke Falls site. Photo courtesy of Mike Zarenski. Another notable historic resource along the riverfront is the Ayers Lake Campground, which drains into the Isinglass via Betty's Brook on Route 202. The campground has been declared eligible at the state level for recognition as a historic site of early tourism. The ancestors of the present owners built its cabins in the last quarter of the 19th century. The Isinglass River corridor supports a diversity of habitats comprised of wetlands, forests, and open space that is home to a wide variety of wildlife. Especially important are the large tracts (>500 acres) of unfragmented land that extend northward from the river corridor. Similarly, the wetland complexes scattered throughout the river corridor, such as those where Nippo Brook and the Mohawk River drain into the Isinglass, serve as important wildlife refuges and travel routes. The Isinglass River provides habitat for many common species of wildlife, such as deer, beaver, mink, and barred owls. A total of six wildlife species, listed as threatened or endangered at either the state or federal level, have been reported in the Isinglass River corridor. These include the bald eagle, common loon, osprey, Cooper's hawk, common nighthawk, and the small-footed bat. According to the New Hampshire Fish and Game Department, the wildlife habitat in the river corridor is rated as moderately to very diverse depending on the potential for human encroachment. More information can be found at the NH Fish and Game's NH Wildlife Action Plan page. The vegetation occurring within the Isinglass River corridor is consistent with that found in the coastal drainage of New Hampshire and reflects a diversity of upland, lowland, and wetland plant species. The New Hampshire Natural Heritage Bureau Inventory (NHI) reports 11 plant species from the municipalities that the Isinglass flows through that are rare, of special concern, or threatened at the state level. They are huckleberry, large yellow lady's slipper, pitcher plant, ginseng, trailing arbutus, American plum, wild lupine, slender crab-grass, river bank quillwort, Englemann's quillwort, and climbing hempweed. Black gum/red maple and northern New England rich mesic forest types have also been identified as "exemplary natural communities", as defined by NHI, that occur within the Isinglass corridor. It is important to note that much of the riparian zone immediately adjacent to the river is largely forested and acts as an important buffer providing shade and filtering out potential pollutants. Rare natural communities such as a black gum/red maple basin swamp and a northern New England rich mesic forest are found within these parcels. Uncommon herbaceous species, such as wild lupine and yellow lady slipper, have also been identified within the river corridor. Above Locke Falls in summer. Photo courtesy of Mike Zarenski. The Isinglass River is best characterized as a coldwater fishery that provides habitat for approximately 20 resident warm and coldwater fish species. Naturally occurring game species include the small and largemouth bass. Naturally occurring nongame fishes include common species such as bluegill, common shiner, fall fish, brown bullhead, and the common sucker. An uncommon nongame species, known as the blacknose shiner, is found in the Isinglass River and has very limited distribution in New Hampshire. Introduced game species include brook and rainbow trout which are stocked annually by NH Fish and Game Department mostly in the Town of Barrington between Routes 126 and 202. Three Rivers Stocking Association and Waste Management also annually stock trout near Locke Falls. Fall stocking at Locke Falls. Photo courtesy of Mike Zarenski. The New Hampshire Fish and Game Department also reports a diverse range of fish habitats in the Isinglass River. The free flowing nature, an extensive riparian buffer, high water quality, and varied substrate types of the Isinglass River are the primary factors that account for the diverse habitats within the river. 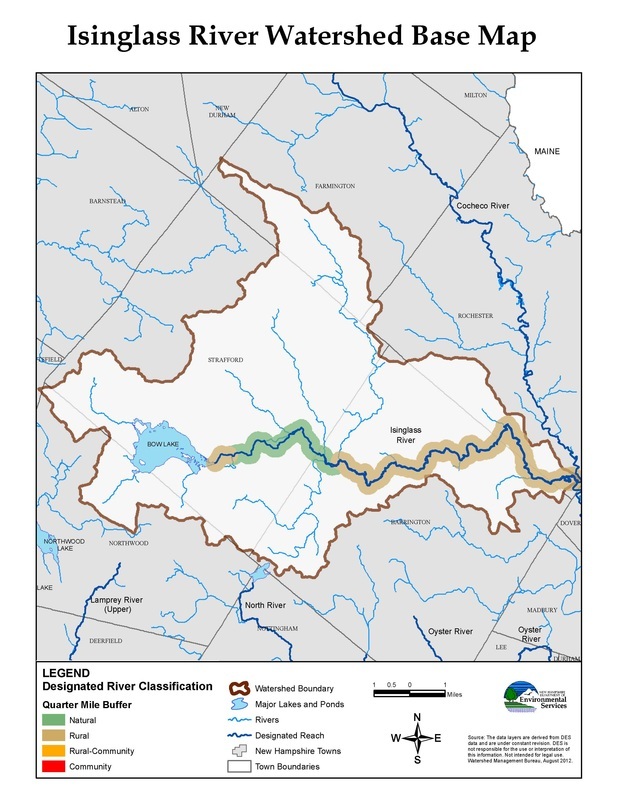 The Isinglass River has been designated a Class B water, and is acceptable for fishing, swimming and other recreational purposes and, after adequate treatment, for use as water supplies. Based on sampling results over many years by the Isinglass River Protection Project and the Volunteer River Assessment Program, the river generally supports the standards of this water quality goal. Overall, river water quality is high. However, since the river is fed by many small tributaries and wetlands, the river tends to be slightly acidic. During periods of low flow, dissolved oxygen can also be low. The more dense development patterns in the downstream portion of the river also tend to limit water quality due to runoff from roads and lawns. Annual reports of water quality monitoring in the Isinglass River watershed are available on the NHDES Volunteer River Assessment Program - Isinglass River page. The City of Dover maintains the only registered water withdrawal (>20,000 gallons per day) on the Isinglass River. Dover withdraws an average of 830,000 gallons of water per day from the Isinglass River from a point just downstream of the Rochester Neck Road Bridge in the City of Rochester. The water is pumped to a recharge well and serves as public water supply. One additional withdrawal point is known within the watershed, on the Berry's River which is a main tributary to the Isinglass River. Water is diverted from the Berry's River to the City of Rochester's water supply reservoir. However, because the city only reports the total amount of treated water they produce it is not possible to know how much of that water comes from the Berry's River. Currently no permitted point source wastewater discharges exist on the Isinglass River.